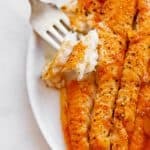 Pineapple Honey Bourbon Grilled Catfish - A simple yet flavorful summer grilled fish recipe made with just a few ingredients including Lawry’s honey bourbon marinade. It is perfect for work days or weekend entertaining! Add honey bourbon marinade along with crushed pineapple and juice to a large plastic bag and shake to blend well. Add catfish to the plastic bag and refrigerate for 30 minutes. Cut off pieces of foil for each fillet. Place each fillet in center of individual foil pieces then season with salt and pepper to taste. Next add both paprika and cayenne to a small bowl and whisk together. Evenly sprinkle on all fillets. Lastly add a tablespoon of the leftover marinade to the top of each filet then fold up sides of foil so that each is sealed completely creating a loose tent but leaving a small gap for steam release. Once the grill is hot, add foil tents to the grill and cover. Depending on the thickness of your fillets, grill for 20-25 minutes or until fish is opaque, tender and flakey.